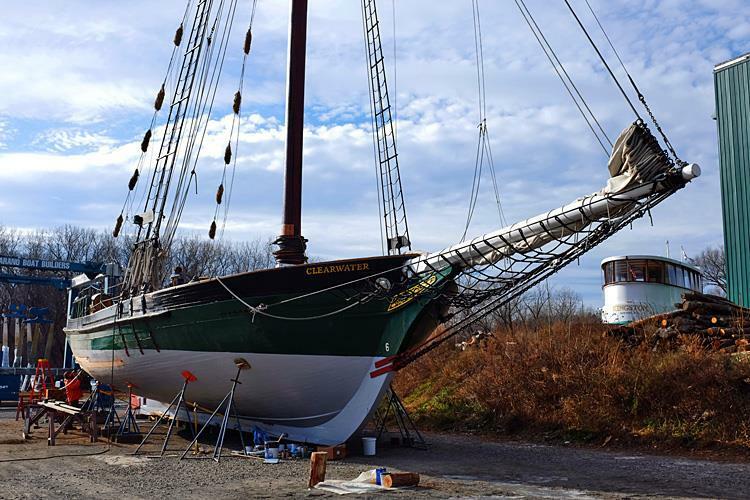 Forty-five years after Pete Seeger and friends launched the tall-ship Clearwater, the nonprofit organization that operates the sloop has launched its first “crowd-sourcing” effort to help fund a new sail and boom for the vessel. The 60-day campaign aims to raise $25,000 to help replace the worn-out mainsail and 12-year-old boom. In fact, the Clearwater Sail & Boom Project began after the crew found a crack in the boom in October, ending the sailing season 10 days early. Matt Soper is Clearwater development director. He says this is the first time the non-profit group is turning outside, specifically to online fundraising and crowdfunding site Indiegogo. And achieving the goal with the help of Indiegogo, Soper believes, would meet with Pete Seeger’s approval. Seeger, the legendary folk singer and activist, died at 94 in January. Soper says the values and ideals of Clearwater are universal - gathering the community to address environmental concerns, a message Indiegogo can further. He says Clearwater receives a substantial amount of its annual donations in December. Plus, December 2 is #GivingTuesday, a global day dedicated to giving back. Katy Coppinger is director of major gifts at Westchester-based Mercy College. She says turning to a site like Indiegogo is one of many ways non-profits are fundraising these days. “It really works well particularly for specific projects or a specific need,” says Coppinger. She says the appeal of Indiegogo should serve Clearwater well and capture the following population. Soper says Clearwater does have its sights set on a younger generation. The Indiegogo effort introduces a new video that features original footage of the 106-foot-long sloop being launched in South Bristol, Maine, in 1969. The film also offers a quick dip into the experience some 500,000 people have enjoyed aboard Clearwater. The Clearwater is now headed for its winter home port in Kingston, where it will undergo routine winter maintenance. Judges for the Indian Point license renewal hearing have dismissed challenges from two environmental groups and the state. Those challenges have to do with storing nuclear waste. The Atomic Safety and Licensing Board Panel has dismissed contentions from environmental groups Riverkeeper and Clearwater along with New York State pertaining to on-site storage of nuclear waste at Buchanan-based Indian Point. Here’s Nuclear Regulatory Commission Spokesman Neil Sheehan. The New York environmental organization founded by the late Pete Seeger has a new executive director at the helm. His music catalog and social activism spanned six decades, but now a major folk voice has been silenced. Beacon resident Pete Seeger died Monday night in New York City after being hospitalized for six days. As a teenager in 1936, Seeger joined the Young Communist League. An early recording features Seeger on "c" for Conscription, a track that appeared on Songs for John Doe, the 1941 debut album of the Almanac Singers, an influential early folk music group.